Is reuse the next wave for water conservation? As pressures on surface and groundwater grow, so does interest in reclaiming municipal water near its source. November 19, 2013 — California is known for many things — surf, sun, cinema — but water sustainability doesn’t likely crack the top 100. Yet it’s leading the way in a trend that’s picking up around the world: municipal wastewater being treated, disinfected and reused near its source for a variety of purposes, from wetlands restoration to irrigation — and, yes, drinking. Water recycling, also known as reuse or reclamation, is not new; nonpotable (not for drinking) water recycling systems have been in place for decades. In arid states, including Texas and Nevada, and rainy states, such as Florida and Virginia, municipal wastewater is collected and treated to an extent that doesn’t meet drinking water standards, but is approved for certain uses that don’t involve human contact, such as agriculture, landscaping and golf course irrigation. Recycled water flows along the San Antonio River Walk, which touts itself as Texas’ number one tourist attraction. Photo ©iStockphoto.com/dszc. 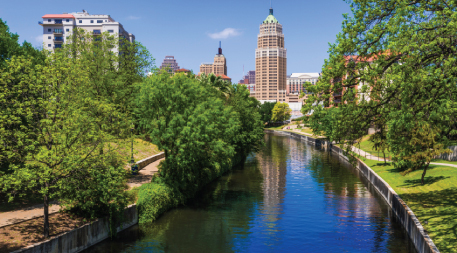 “Everything that goes down the drain here is treated and reused,” says Greg Flores, vice president of public affairs for the San Antonio Water System, citing university campuses, the San Antonio River Walk, and Toyota and Microsoft facilities as examples. The more notable change, however, is that a growing number of municipalities are shifting toward or considering “potable reuse” — recycling wastewater into drinking water. The Orange County system, like most potable reuse projects today, practices “indirect” reuse, which means there’s an environmental buffer — a groundwater basin, say, or a reservoir — between the wastewater treatmentExperts say reuse technologies have been proven, and treatment plants can get wastewater as clean as distilled water. process and the municipal water supply intake. In direct potable reuse, there’s no environmental buffer; water is treated and sent directly back to the municipal water supply. It’s something that more, primarily arid, places are starting to consider as a way to make the most of their increasingly scarce water resources. Experts say reuse technologies have been proven, and treatment plants can get wastewater as clean as distilled water. The three-step process used in Orange County — microfiltration, reverse osmosis and a combination of ultraviolet treatment with hydrogen peroxide — is becoming the standard for potable reuse. “That’s state of the art right now,” says Wade Miller, executive director of the WateReuse Association. Direct potable reuse is already practiced, largely as an answer to increasing drought, in Big Spring, Texas, and in the southern African nation of Namibia, which boasts the world’s first major direct potable reuse system. Cloudcroft, N.M., expects to have a new direct potable reuse system up and running by next summer, and projects the system will provide 40,000 of the approximately 70,000 gallons used daily by the town. Brownwood, Texas, has plans to start direct potable reuse — it’s just waiting for city council approval — and San Diego is considering it as an alternative to scaling its existing million-gallon-a-day indirect reuse project to 15 million gallons. Miller estimates that 7 out of every 100 gallons of U.S. wastewater gets recycled near its source, and says that number is growing about 5 percent annually. Water reuse is regulated at the state level — although the EPA has issued guidelines for reuse approximately every decade since 1980 — and more than half the states have some kind of regulation in place. “We literally move water over a mountain range to get it here from Northern California,” says Shivaji Deshmukh, assistant general manager for the West Basin Municipal Water District, which runs a groundwater recharge system that supplies southwestern Los Angeles County. “While we’ll always need that supply, it does take a lot of energy to do that.” Reusing water locally takes less. In Orange County, recycling water for the groundwater replenishment system takes half the energy of importing water. The biggest hurdle, however, lies in gaining public acceptance. When people hear about “toilet to tap” technology, they get nervous — and grossed out. The biggest hurdle, however, lies in gaining public acceptance. When people hear about “toilet to tap” technology, they get nervous — and grossed out. That’s why when municipalities look at reuse, the hardest part usually isn’t figuring out the right technology or engineering the system; it’s educating the public and involving them in the process in order to gain their approval. 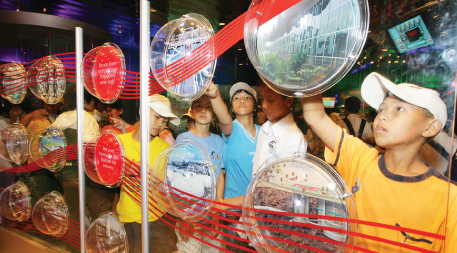 Singapore’s NEWater Visitor Centre aims to build comfort with water reuse, which is common in the tiny island nation. Photo courtesy of NEWater Visitor Centre. Part of that is pointing out that water reuse occurs whether municipalities design for it or not. Wastewater treatment plants are constantly discharging effluent to waterways that eventually make their way to a water treatment plant somewhere. “Everybody’s downstream,” says Jenny Murray, recycled water program manager for Denver Water. Californian cities have found that as public understanding of water reuse grows, so does acceptance of its practice. “Almost one in five Californians are already connected to a utility that uses, or has [as] part of its water supply portfolio, potable reuse,” says Dave Smith, managing director of the WateReuse Association’s California chapter. There’s no way to tell where else potable reuse, direct or indirect, will be adopted, but it’s clearly the direction more municipalities are looking. As water scarcity becomes a closer reality for many, people have no choice but to overlook the “yuck factor” that may have constrained the pursuit of reuse in the past. There are many rivers, of which the Colorado is the best known, which are being reduced to intermittent rivers in the US, and this will probably only worsen as climate change increases. In fact, it would be wise if all. developed countries , arid or not, followed the water reclamation examples now being set , as well as depending on consumer water use reduction. Water is important for ecosystems as well as for humans, and reducing abstraction from natural ecosystems reduces harmful impacts on those ecosystems . several years ago-- and have not rebounded from that low yet. A look at snowfall in the watershed and catchment areas as a whole might show whether or not a rebound could be expected there . But whether or not a rebound could be expected , it seems to be that a more prudent and sustainable use of water needs to occur everywhere, and at all levels, not just at the consumer level, where it is. most frequently urged in some water-rich developed countries. We all need to live sustainably, not just those in arid and semi-arid areas and countries . 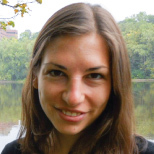 All water withdrawals affect riverine ecosystems. Whilst reclaiming municipal water and harvesting ground water (rainwater and/or stormwater) seems to be viable solutions in view of advanced membrane technolgies and disinfection methods, compettive costs are essential. Are there any benchmark project costs and meaningful comparison (say Las Vegas tertiary reclamation treatment) that justify the increasing use of tertiary treatment of municipal water by membrane systems?